I admit it - I get busy with life - 3 kids, 2 dogs, 1 husband, writing books, editing books etc... And, I forget to post to my own blog. It's not that I'm not writing. I've been writing like crazy lately. Poetry, songs, flash fiction, A NEW BOOK! Yes, this winter I wrote a new book. I hadn't planned on it. I finished writing TABUPU AND HE KEY OF DESTINY sometime in January, and I decided to take a break from novel-writing. My head decided that. My soul had other plans. The story of Margaret Star and Gray Trax unfolded and evolved over a period of 4 weeks. I have NEVER written a book that quickly. The characters just spoke to me. As usual, I was inspired by events happening in real life - a horrible school shooting tragedy had just occurred in Florida, and my daughter's middle school was on lock down because of bomb threats two days in a row. Also, there was a student (whose locker was right next to my daughter's) who threatened to "shoot up" the school and claimed to have brought weapons to school with him. My daughter turned the boy in, as he watched from across the hallway. Not the most comfortable moments of life. So this anxiety inside my heart translated into questions, then morphed into a story. The questions: What happens to the girl who fell in love with the school shooter? What does her aftermath look like? How does she miss the warning signs? Blinded by love? Which is why my novel was originally called Blind Love - BLECH! Horrible title! So, I had my basis for the story. Then the characters came to life and told me they were way more important than the plot - which is always true for me. I write character driven novels. And - because my characters drove the plot - my story changed. It became more about 2 deaf teens, both trying to navigate life in a hearing world, both dealing with their own sets of difficult circumstances, who find comfort and inspiration in each other. Yes, they fall in love. Yes, one has mental health issues that urge him toward violence. Yes, one theme of the book is that intimacy can be blinding. But, the real theme is that love can be the driving force in overcoming hardships. Love makes us strive to be the best versions of ourselves. After leaving the field of Deaf education 14 years ago to raise my daughters, I really loved diving back into the subject of Deaf culture and all of its intricacies. My book is now called HEAR ME. That could change. It's early. I'm still editing. And, as I edit, as always, I'm writing poetry and songs and flash. These are my release. Here is something I wrote yesterday, as I stared out at my favorite beach from the condo balcony. 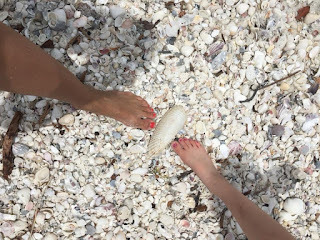 Smiling and breathing the heavy salt air that wraps around all of Your creations. Three of them are right next to me. I can close my eyes and see them as babies. 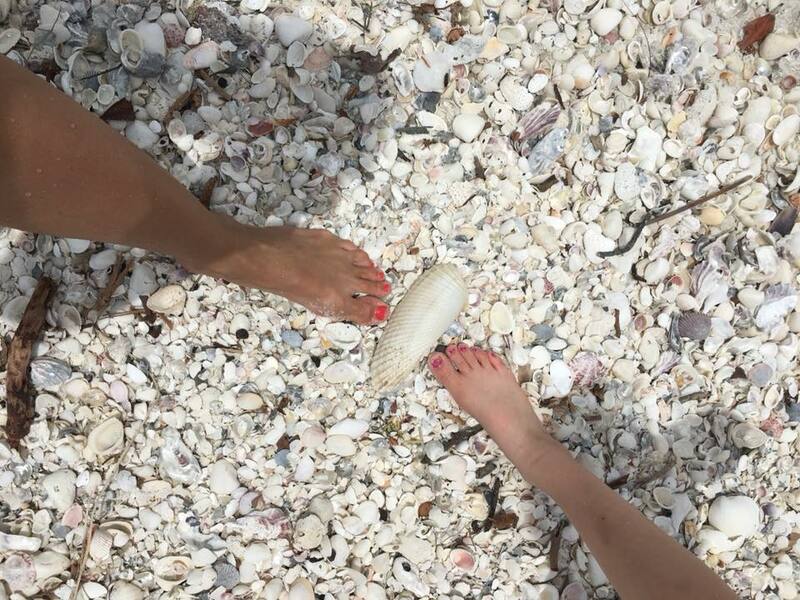 Just yesterday they toddled over the sand with tiny feet. And now they vacillate from cartwheels and whirlpools to sun worship and tan seeking. Ah, the mystery of time. Only You know the solution. While pale blue invites the sun to show itself over the Gulf. Such vast expanse between the two. The fish jump in the lagoon. Invisible bugs nibble at the skin on my elbows. Foamy waves crawl slowly to the shore. All at the direction of Your hand. Overcoming Fear With Human Connection. What's Your Trick? And the truth will take you far. I’m sure Anna was just as nervous as her son was about leaving England alone, a newly widowed mother. It was probably scary for her to travel halfway across the world to work in a far-off land for a stern King whose cultural expectations were quite different from anything she knew. Her trick for dealing with her fear was simple – Whistle. We’re all afraid of something, and we all have tricks to deal with our anxieties. As a child, my brother and I experienced what we and our parents believed was a near abduction. The creepy man who chased after us down a cloaked path to a quiet park one summer afternoon denied any unkind intentions when he was questioned later. Our suspicions remained nevertheless. The paralyzing fear that shot cold through my veins that hot summer day, chilling my cheeks and my limbs as they pumped for dear life, has also remained. It’s dormant most of the time, but at the right moment, it can rear its creepy head into any experience and freeze me. You see, at the end of the path, I turned one way and raced through the woods toward home. Without discussing his planned escape route, my brother had run in the other direction, toward the playground and the backs of neighbor’s houses. When I made it back to my home, breathless and hysterical, I thought my brother had been kidnapped. Words spilled from my mouth, probably unintelligibly, as my mother stood gaping at me from behind her shower curtain, trying to figure out what had scared me into such a state before throwing a towel around herself and hurrying to call the cops. Even though everything worked out that day, the fear of strangers stuck with me. Most of the time, I’m totally functional, outgoing, and independent. But, when I’m caught in a bout of paranoia, my overly imaginative brain can conjure some doozies about who’s going to break into my house when I’m alone and what their sinister plans might be. Like Anna’s son, fear attacks me when I travel alone, especially to new places. It’s kind of a conundrum, because I love to travel alone to new places! I’ve been halfway across the world by myself, flown to France and Italy alone to visit family. Being by myself allows me to take in people and places in a way that’s not possible when I’m accompanied by my kids or husband or even friends. I enjoy traveling with others as well but being alone is satisfying in a different way, undistracted. So, the anxiety I experience before and during a trip is really annoying. I nearly always almost cancel. I stand in line at security at the airport and imagine all kinds of stories. Someone’s following me. Someone’s a terrorist. Someone’s a serial killer. And, of course, I’m the target. Every situation has the potential to be a risk. Hotel elevators- perfect place to subdue and abduct a person. A semi-deserted street in mid-afteroon in Anycity, Anystate – crazy people prowling for victims. Only recently did I finally discover my own trick to conquer fear. When on a trip to New York City with my girls, my oldest was battling her own anxieties, and she was fearful of getting into a taxi with a driver who was a stranger to her. I told her – just talk to the guy. When you realize a person’s humanity, you find likeness in him. You see him not as a taxi-driving stranger but as a person. Someone’s husband or father. Someone who’s traveled far from home to make a better life for his family. Someone who likes to eat pizza with mushrooms on it, just like you. By teaching my daughter this, I realized it was actually my trick. When I’m afraid, I talk to people. I find human connections, and my fear evaporates. I believe that we are here on this Earth for the sole purpose to connect with other people, to learn from them and to teach them. I believe that fear blocks opportunities for connection, but when we push through the blockades and reach out to strangers, we break barriers and build meaningful and purposeful experiences that stay with us. In other words, my taxi-driver has something to teach me, and if I’m too afraid to talk to him, I’m missing out. Finally, sans luggage, I slipped into the seat of my cab, where my driver was chatting on speaker with his son. This made me feel comfortable, because the guy was a dad. Still, crazy thoughts jumped around in my mind about what could happen if this stranger took me somewhere other than my hotel. What if he was only posing as a taxi-driver and was actually a creep? I pushed the inane thoughts away and started chatting with my driver once he was off the phone. When I face my fear of strangers and being alone I am rewarded with beautiful people and experiences that seem driven into my life by God and fate. This guy was inspiration, personified. He was unusually chatty for a taxi-driver. Usually, I have to ask all of the questions, but Ammikhi was generous with his conversation, telling me about his kids who live in Israel, his talented dancer daughter, his headstrong son who plays basketball, and his youngest son who has a big gregarious heart like his dad. We shared the headaches and triumphs of raising tweens, and he gave me some good advice. He asked me about my career in writing and I told him a little. He seemed especially interested in my Whisper Trilogy, which is fiction - spiritual warfare for teens. We discovered that we both have a strong belief in a higher power and that we both believe in the idea of unseen forces that lead us in certain directions while we’re here on Earth. Some good forces, some evil. It was a deep and spiritual conversation to be having with someone I’d just met. He then shared that he is a rap artist who writes “positive rap music.” I came to understand, through our conversations, that everything Ammikhi does is done to spread positive energy, righteousness, and love in the world. He’s just a really awesome soul with a talent for writing and performing awesome rhymes. He played one of his songs for me – ‘Stay,’ and I loved it. The tune was catchy and soulful, and the rap was beautiful, a testament to what he believes about love relationships and how we should interact with our partners. I immediately purchased it from itunes and have listened to it several times since. My 45 minute drive with Ammikhi was purposeful. I feel like he was meant to remind me that the unknown – people and experiences – don’t have to be foreboding. A stranger can become a friend or adviser in the space of a cab ride. Common threads twine through strangers’ lives, connecting us. Our unique life lessons can be imparted, paid forward with our hearts and our tongues. Sometimes our stories are the best gifts we give. Ammikhi set the tone for my trip to Chicago. Once my head was reset and my anxiety had evaporated, I met each new experience and person (even the ones wearing detailed alien costumes and toting weapons) with a positive attitude. Some amazing people graced my life over the weekend. 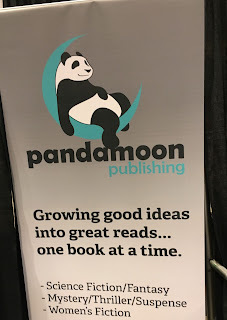 I was able to meet my fellow Pandamoon authors and Mindsoak colleagues in person, which was really cool because I’ve interacted closely with them online for almost two years. “Comicon” would not typically be my thing, but after being reminded that all experiences, even the most unlikely ones, have purpose for my life, I walked into C2E2, a.k.a. Crazytown, with an open mind, ready to share with others about my books and writing and ready to learn whatever I could from a myriad of superheroes and villains – 162,000 on Saturday to be exact. When I contacted Ammiki to ask him to drive me back to the airport on Sunday, he was glad to agree to do so. He has a super-strong work ethic and a positive outlook on working. He asked if he could purchase all four of my books, and when I offered to gift them to him, he refused, said he wanted to support good people who spread good messages. I proudly signed them and sold them to him, feeling like we each had a piece of each other as a memory of our short time together. He has my words, and I have his music! Now, every time I listen to Stay or think of Ammikhi, I am reminded that there’s always opportunity for comfort and purpose and wonder, even in the sometimes scary shadow of the unknown. This post was originally shared on Mindsoak Me as answer to the question - When do you feel most alive? The first thing that popped into my mind when Jon asked this question was ~when I am in Italy. There’s a raw energy that captivates my spirit the moment my feet touch the dry, cracked earth in Valanidi – the town in which my father was born. Every swallow of rich, syrupy espresso, every long breath of fresh mountain air – tinged with the aroma of baking bread and peeled garlic, every dip into the clear blue Ionian Sea. The breathlessness of crowded streets, the heady stench of overripe fruit, the contradictions that lurk behind broken portico walls then reveal themselves unapologetically, breaking every rule of logic and reason. The crooked smiles and musical dialects that change with every quarter mile of country road. The old women in head-to-toe black who pinch my cheeks and the young women in tight jeans and tube tops who shoot me the evil eye. All of it is holy to me. Every aspect of the culture, its people and places, transforms me from living to alive in the space of one breath. I’ve often thought that perhaps there’s something about being in the birthplace of my extended family, my tribe, that stirs and amplifies me. Maybe there are geographic coordinates in my genetic code, somewhere. The first time I stepped foot into Calabria, I felt that this was where I could be my best self. The first time I looked into the eyes of the strangers who were my cousins, I sensed that I was at home. My skin fit like never before. I felt free, unleashed, unhindered by expectations of culture and society. Energy seemed to infuse into my core from the very ground. Because it was the ground of my ancestors? I didn’t understand it, but I felt a palpable connection to this place. The sensation first undid me, then laced me up again - the way I was meant to be. And for the first time in my life, I didn’t need to understand why. Usually, I pick everything apart, especially the why’s behind every situation. There, I didn’t. The feeling of wholeness was enough. In my home environment in Pittsburgh, where I raise daughters and manage a household with pets and laundry and schedules, where I write using a process, I am a creature of habit. I wake up early. I must have coffee before speaking to anyone. I exercise. I stick to the plan, and I don’t sit down for a rest. I tire in the evening and go to bed early. It’s the daily grind, and I’m no different from most American moms. I have learned through multiple trips to visit my family in Italy that I am a different creature there. I somehow shed the skin of the American impostor who inhabits my body in the meantime, and I fully submit to the donna inside. She smiles immediately, even if she wakes up drenched in August sweat at four o’clock in the morning, because she can no longer sleep in the sticky stillness. She needs conversation more than sleep and perhaps even more than coffee. She doesn’t require much but does thrill at the idea of a daily gelato and a nap on the pebbles of her favorite beach. She has no plan and doesn’t bristle when she realizes nobody around her has one either. She breathes deeply and often. She stays up all night with her cousins. To talk about nothing and everything. To sit quietly together. To be what they cannot be in the mundane of their daily lives. I have tried and tried to bring this donna back to Pittsburgh with me. After my first tearful goodbye to my cousins in Europe, I returned to Kent State University as a senior with a one-cup Bialetti and a penchant for homemade red wine. I wanted to take Italy back home with me. These pieces I could shove in my suitcase, but the memories and the transformation in my heart stayed alive as well. I insisted on experiencing life as vividly as people do in Italy, that I would live filter free and straight-up, not just rolling with the tide of ups and downs but celebrating all of it. It was easier when I was single and in college. Harder now with a family of five, being a part of the super-sized, super-scheduled American society in which we live. We try to balance. I try to summon the donna every day. In my kitchen, she is always with me, insisting on flavors of fresh basil and earthy Extra virgin olive oil in my dishes. I squeeze time from no time for dinners with my aunts, uncles and cousins here, ensuring that the value I place on family ties is evident in the way I live my life. One of my favorite lines in my book, Beautiful Secret is – “For Italians, blood is more important than breathing.” Family first is a way of life for us. And, close friends become family, so they are woven into our fold of loudness, boldness, honesty, and loyalty. 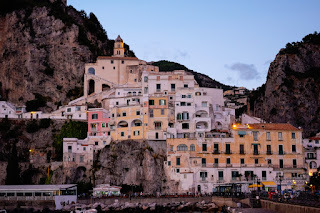 I’ve taken my kids to Calabria so that they can understand our family values more deeply, so that they perhaps will feel the pull at a young age and never have to ask why we do things differently or wonder exactly where they fit or who they are. As young children, they experienced the energy too. They express it every time their eyes shine with longing to go back to Calabria. Every time, they describe their first gelato, I can taste the heady awe of their first time in Italy. So, to answer the question – when do I feel most alive? I’m most alive when I am sitting on my favorite Italian beach, Saline, where the pebbles dig gently into my skin, leaving a trail of pink marks and the rocks rise up from the sea just daring me to use them as a springboard into freedom. I saunter easily into the clear blue water, my cousins at my sides, playful as first friends. I never feel the chill of the water or the sun’s late summer singe or the scary sting of what may happen tomorrow. I’m alive in the moment. I’m most alive in all of the moments I spend at that beach and on that mountain and in the company of strangers who became family after just two kisses. And even though this intensity can’t translate to every moment of my life, it’s okay. The memory residue of these exponentially concentrated moments splices into my day-to-day. In fragments, in shadows, in full-blown gut-punches of nostalgia. They shake me to life again. 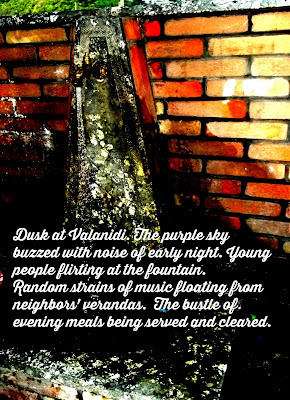 The donna whispers an Italian love song and laughs as the words take shape on my lips. And I remember, for the moment, who I am. The Birth Of Inspiration - What Moved Me to Write Beautiful Secret. 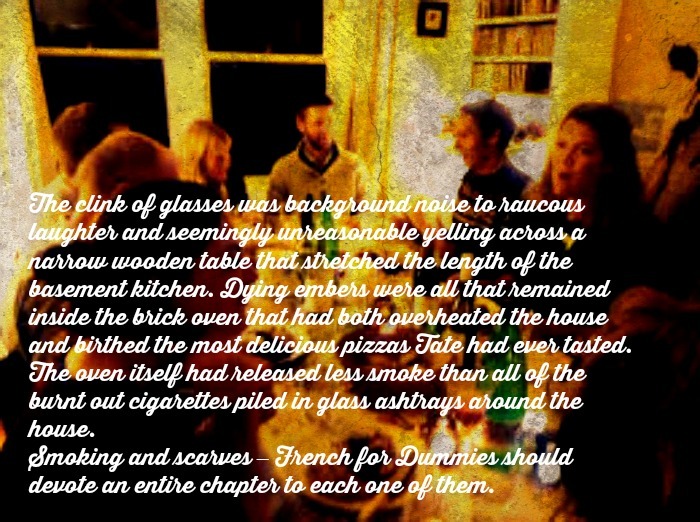 ~For those of you who have read Beautiful Secret and for those of you who are obsessed with the characters and settings... here is a snapshot of why my first trip to Europe was the birth of my inspiration to write this book. 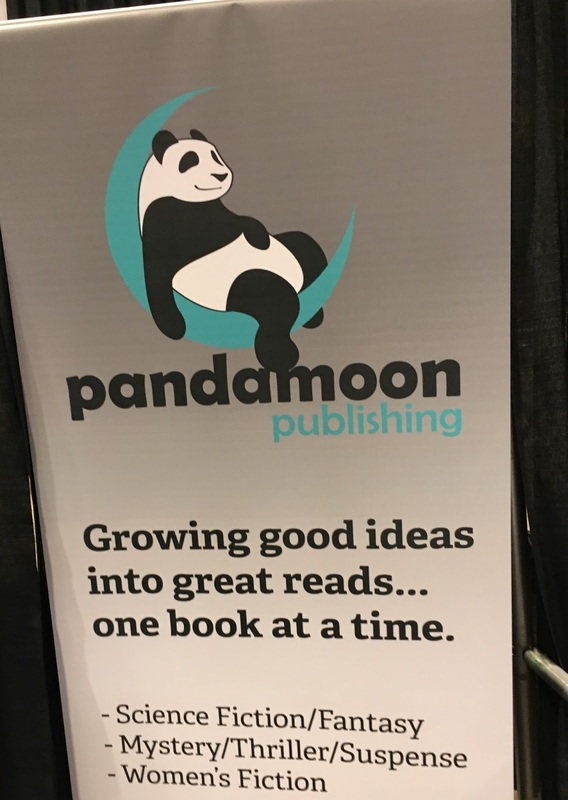 This was originally published on the Pandamoon Publishing website. This morning I was going through pictures to use for marketing of my upcoming book, Beautiful Secret. 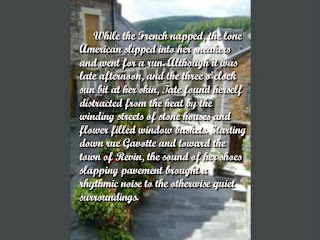 Parts of the story are set in Revin, France, which lies in the Meuse River Valley in the Ardennes, just west of the Belgian border. Quaint Revin is nestled between slate gray mountains and blanketed by thick forest, which gives it a storybook feel. My uncle and aunt – Zia and Zio, as I refer to them, built their home and family there. This month marks twenty-two years since the first time I visited my family in Revin and went on to Italy with them. It seems like an eternity ago. It seems like yesterday. It was the summer before my senior year of college. Boarding the plane at Pittsburgh International Airport, I felt a sense of dread at leaving my then-boyfriend and college life to go away for three weeks with my parents. My mind was full of all the things I’d miss. I had no idea. No. Idea. 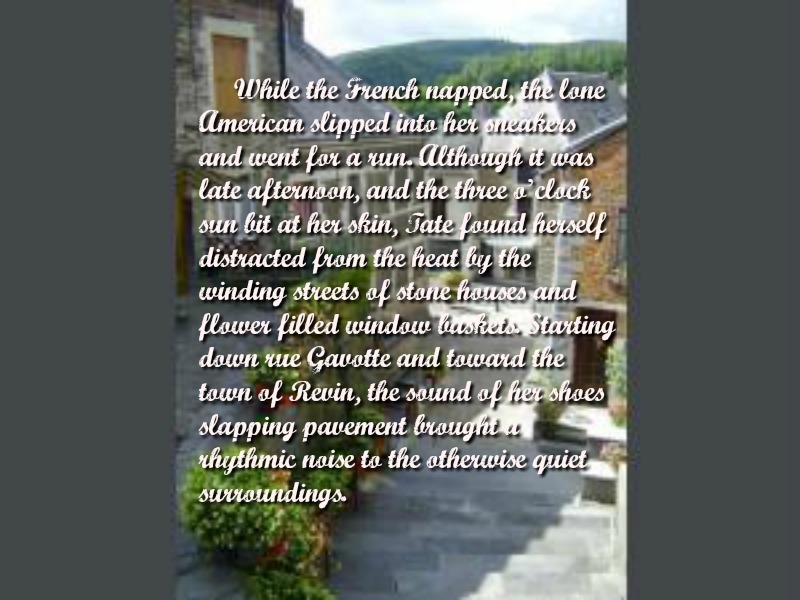 My first few hours in France were a blur of exhaustion. I was so jet-lagged, I slept the morning away along the scenic riverboat cruise of the Seine. I slept past Notre Dame, for goodness sake! When I think back to those first moments, I’m not surprised, actually. Although I adore Paris, sight-seeing was never my thing. I didn’t fall for Europe until its people claimed my heart and shocked it to life. My cousin, Nicole, who still teases me about how Paris put me to sleep, was the first person who captured me. Her laughter is like bubbles of champagne, which she refers to as French Coca Cola. She has a breezy way about her that all at once makes you feel confused but totally relaxed about it. She picked up my parents and me in Paris and drove us the three hours to the family home in Revin, all the way preparing us for the people we would meet and the places we would see. I had five years of French under my belt, so I was confident I would be able to chat up the locals. That was until they started actually conversing. The French speak quickly, and, at first I had a hard time following. My cousins were patient with me, though, and they were happy that I spoke some French, even if I wasn’t as fluent as I thought I was. Nicole, spoke good English, so she helped. My Zia and Zio and all of my cousins spoke Italian, so my father could understand and speak pretty well. He was raised by his broken-English speaking mom and a father who never totally assimilated to American life. Even though he was rusty, he caught most of the Italian. Eventually, my Zia’s basement kitchen – where we shared every amazing meal - was flooded with smoke from the ever-lit cigarettes and brick oven and also with shouting and laughter in all three languages. We ate, we drank, and we did whatever we needed to do to understand each other. The funny thing was, that before I even understood the words that they were speaking, I had already fallen in love with my family. There was something deeply instinctual about this love, totally unprompted and unexpected. These were my people. Their blood was my blood. Their history – all of the joys and sorrows that had graced their fates - was part of me. It was like I could feel all of it the first time my Zio slid his sneaky grin my way. My memories of my first time in Revin are touchy and feely and totally vivid. Winding streets, lined with sturdy stone homes. Flowers everywhere. Cracked sidewalks and crooked storefront signs. The streets smell of baking bread and river moss, with the occasional waft of strong perfume from an impeccably dressed woman – complete with fashionable scarf at the neck (no matter what the temperature is outside.) Every morning, I would wake up and go for a run through the town. Sometimes, I would cross the old stone bridge that straddles the Meuse river. Other mornings I would traipse deep into the neighborhoods where flower baskets greeted me from shuttered windows and old men in fedoras tended their gardens and took little notice of the crazy American runner. No one else in the town seemed to be concerned about the amount of bread they were eating. Maybe I was the only one who seemed to down an entire baguette with every meal. The bread was crazy good. And, speaking of gardens, I was completely taken with my Zio’s backyard garden. The door from the basement kitchen led outside and into Eden, as far as I was concerned. My Zio didn’t hide the pride he felt about his work. This little man, with his wrinkled bronze face, his up-to-something smile, and tiny sandaled feet, spent hours outside with his plants. Flowers, yes, but vegetables and fruit too. The pungent bite of almost-ripe tomatoes, lettuces, fava beans, hot peppers, cassis berries. The garden was its own little microcosm, complete with chicken-house, a.k.a. grappa factory, where Zio prepared his famous liquor. After one week in Revin, our French family accompanied us on my first trip to Italy, to the town where my father was born. The voyage was life-changing, because of the people who shared it with me. Yes, it was amazing to walk through my grandmother’s memories and to see my ancestors’ homes. 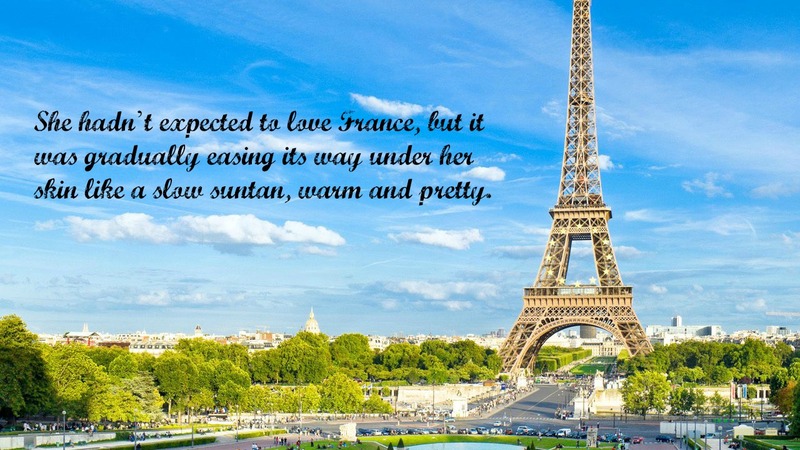 Yes, France and Italy were unlike any place I’d ever been, both in their lush natural beauty and in their rawness. But, without a doubt, the trip was special because of the people. If it weren’t for my sweet Zia and her amazing gift of gab, I would never know the stories she shared with me over hours of espresso and talk at her basement kitchen table – stories about my grandmother as a young woman and mother. My cousins, Benoit and Nino, became like brothers to me on this trip, one at each side at every church, beach, or family dinner. They took great joy in playing tricks on me – scaring the heck out of me by driving like maniacs on curving mountain roads that can’t possibly be meant for even one car to drive upon, let alone two. They gave me my first shot of grappa and laughed their heads off when I shot it as if it were a vodka lemon-drop, rather than sipping it slowly as I was supposed to. My throat was on fire for hours after that. They held me when I cried after the first time I met my cherished late Nana’s brother, whose sea-blue eyes were unmistakably hers. It was impossible to say goodbye. I didn’t sleep a wink on the plane ride home. I cried the entire eight hours from Rome to Pittsburgh and then slept for days afterwards. I was afraid I would never see my family again. Little did I realize - love like that is undeterred by distance. The following summer, my two soul brothers came to Pittsburgh, where my American family introduced them to burgers, supersize, and, I’m embarrassed to admit, Hooters. We continue to visit back and forth, and now, with Facebook, it is so easy to stay in touch. It’s important to me to keep these family bonds alive, to pass this virtue on to my children so that they instill it into their own children someday. Beautiful Secret is fiction, but many of Tate’s stories are my stories. Some people scrapbook to remember. I write novels. 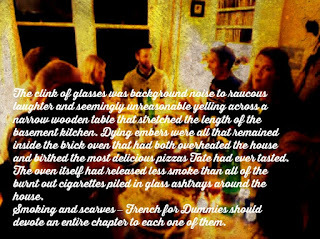 That fall, after my first life-altering trip to Europe, I returned to Kent State University with a bottle of my cousin Nicole’s crème de cassis. She and my uncle had made it from their very own berries and had wrapped it carefully so that it wouldn’t break inside my luggage. The syrupy wine was sweet and tart with just the slightest bite of alcohol. At night, in the heartland of Ohio, I’d sip it and remember my walks through the garden with Zio in Revin. Even now, twenty years later, I can smell the peppery sweet berries that would burst into the air with a snap every time I opened the bottle. One thing I really love about being a writer is that it allows me alone time during which to express myself through the written word. I'm the kind of person who needs that. Being an author also allows me to connect with readers through my books. Since I am a strong believer that life is all about connecting with people and developing relationships, I feel really lucky that writing allows me to do this. A few years ago, I met a young lady who read Whisper and was inspired by it. As we got to know each other, she confided in me that she was working on a book of her own. I know it's kind of nerdy, but I get really excited to talk with teens who write! Nadette entrusted her then-partial manuscript to me. I read it, and I encouraged her to continue writing. During her senior year of high school, one of her teachers made it a graded project that her students publish their writing. What a phenomenal idea! Now, a year later, Nadette's young adult novel - Illusion - sits on my nightstand, and I am anxious for a sequel! Not only did Nadette complete her graded project - write and publish a book, but she took it a step further. Nadette has jumped in to the twitter and Facebook writing communities. She is networking with other Pittsburgh authors and working hard to get her book out there. She is learning how to brand and market herself as a YA author on sites like goodreads, and she consistently writes for her blog. So, young writers - you can do this! Be inspired and motivated by this eighteen-year-old author whose book is just amazing! Nadette was kind enough to answer some questions for me. See below. Check her out on her website, and read Illusion! It is a paranormal romance that will keep you turning pages and begging for more at the end! 1. Tell me a little about yourself and when you started to write. I'm eighteen years old and a recent high school graduate. I love reading, writing, and dancing. I've been writing pretty much since I learned to read. I remember writing little stories in kindergarten and bringing them in to show my teachers. In the second grade I wrote my first "book" and ever since then have writing more and more. My debut novel I actually wrote my freshman year of high school. Then, this past year I had a creative writing class at school and the teacher inspired me to get the book back out and work on it again. 2. Tell me about your book. What inspired you to write the story? My book is called Illusion, and it is about a girl named Addison who has very strange dreams. Soon, the dreams start blending with her waking life and she can't tell what is real and what is just a dream- an illusion in her mind. I wanted to write this book because I find dreams fascinating! Ever since I was a little kid, I would tell my mom dreams that were really weighing on me and she would be able to tell me what they meant and it instantly made me feel better about whatever situation I was dreaming about. Now, my friends call me when they have a weird dream and I'll analyze it for them. I just think dreams are our mind's way of telling us how we really feel about a situation and I think they are important to look into. I wanted to write a book centered on dreams so people could relate to it, but I wanted a story that had a fantastical dream world that people could lose themselves in at the same time. 3. Are you a plotter or a pantser? Do you outline? I actually wrote Illusion with no plot at all. All I knew was the ending I wanted to get to. I prefer to write what comes to me or what feels right for the character and scene at the time. Once I wrote the first draft though, I went through and outlined the whole book down to all the little details. For my next book, I'm trying to plot it out first to see how that goes. 4. What are your currently working on? Currently I am working on promoting Illusion and writing the second book in the Illusion Trilogy! I'm really excited to dig deeper into each of the characters in the second book. 5. You write a lot about dreams on your blog. Tell me about your most vivid dream? 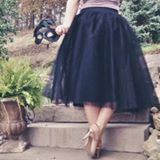 Actually, this is a funny, but sad story: at my senior dance recital, I was in a lot of dances and didn't have much time to change in between. Because of that, a friend and I missed the call to go backstage for our dance and ended up missing the whole first half of the song. We made it on for the end of the dance, a part I was featured in, and everyone was staring at us like "Where have you been?" I've never done that before, so it was very embarrassing. Since then, I've been having very vivid dreams where I missed my other dances too or forgot to show up to the recital entirely! 6. What are your top 5 favorite books or authors who have influenced your writing? I've read so many books that's a tough question! 1. Stephen King- I like scary movies, so I started reading some of his work. I'm amazed at how many books he has written in his career and they are all unique and really good. I've read his memoir about writing, and it inspired me to finish my book and put it out there. I have pages in the memoir highlighted and bookmarked so I can read it any time I'm struggling with something writing-wise. 2. The Scarlet Letter- It's a classic book that I had to read for school and ended up loving. The book has so much symbolism and irony and depth, and I am always inspired by the story and writing. The book actually had some influence in my book for the antagonist. 3. Ally Carter- I have been reading her books for years and really admire the way she creates such interesting characters that are still relatable. She has three very different types of series and I love them all! I loved it too when she wrote a novella combining two of her series; the story was so good! 4. I'm a fan of Veronica Roth because she was young when she wrote, Divergent. It is inspiring too to see how far the book has gone and how it has turned into a movie franchise, and she wasn't much older than I am now. 5. J.K. Rowling- I am amazed at the world she created- it even has it's own representation in a theme park. I think it's incredible that a story that was rejected multiple times has grown into such an incredible franchise. Everyone knows Rowling's name and everyone knows about Harry Potter, and I think that is so cool. She has helped so many people too, and I find that inspiring as well. Noelle's social links are below. Unfortunately, they are hard to see, but they are there! Blogger is being a jerk today, so just click on the white space next to the description, and it will take you to said website! Nadette Rae Rodgers lives in Pennsylvania. Her passion for writing developed at a very young age. Her interest in dream analysis was the basis for this book. She hopes this book will inspire others to achieve their goals in life. 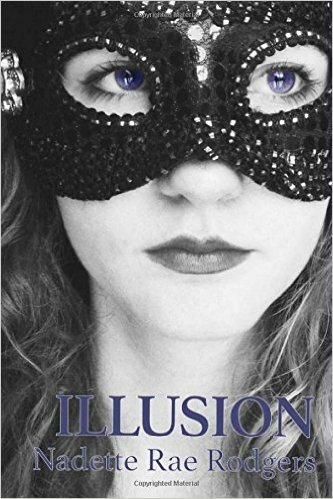 Illusion is her first published work. It is the first book of the Illusion Trilogy. My memories of my first time in Revin are touchy and feely and totally vivid. Winding streets, lined with sturdy stone homes. Flowers everywhere. Cracked sidewalks and crooked storefront signs. The streets smell of baking bread and river moss, with the occasional waft of strong perfume from an impeccably dressed woman – complete with fashionable scarf at the neck (no matter what the temperature is outside.) Every morning, I would wake up and go for a run through the town. Sometimes, I would cross the old stone bridge that straddles the Meuse river. Other mornings I would traipse deep into the neighborhoods where flower baskets greeted me from shuttered windows and old men in fedoras tended their gardens and took little notice of the crazy American runner. No one else in the town seemed to be concerned about the amount of bread they were eating. Maybe I was the only one who seemed to down an entire baguette with every meal. Ahhhh, summer. I love the lazy mornings, the poolside days, the s’mores by the fire nights. I planted my garden last weekend, and I am so looking forward to fresh lettuce and herbs, pungent tomatoes, and waxy hot peppers. I’ve already started harvesting the arugula and made a salad with it last night. There’s nothing like fresh greens from the garden. In summer, I do a ton of meal salads. I like to toss chicken or burgers and dogs on the grill for the kids and make a huge salad for my husband and me and whoever else shows up at my back door for a night swim. My salads are not just lettuce, tomato and some cucumber. (Actually, I don’t like cucumber in salads, because I think it makes the salad taste watery – but that’s just me.) I love adding different grilled proteins and cheeses, nuts, and whatever vegetables are in my fridge. Since followers have been asking for recipes, I thought I would do a post of some of my favorite summer salads. My very favorite – I found a version of this recipe a few years ago, and I’ve been changing it up and eating it every since. The cheese is the best part. It doesn’t melt on the grill but gets this chewy, soft consistency and takes on the grilled flavor. It’s delicious. Prepare lettuce, onions, and cheese and place them on a platter. Combine oil, garlic, mint, lemon, salt and pepper and brush some onto the veggies and cheese. Place the veggies and cheese on the hot grill. Grill romaine until the edges start to char. Grill the cheese until it starts to get just slightly melty, about 5 min. You can chop the lettuce, onions and cheese and put it in a big bowl or leave it all whole and serve on the platter- whichever you like. It’s prettier when it is served whole on a platter, but the flavors mingle well when mixed in a bowl. Top with the remaining dressing and serve. When I have a bunch of veggies in my fridge that I want to use up, this is my go to summer salad. It’s bursting with flavor, and the addition of blue or gorgonzola cheese adds a special bite and pairs perfectly with the tart balsamic. 2 heads of chopped romaine. Place chopped romaine in a large bowl or on a platter. Toss with more balsamic dressing. Perfect salad for a pizza night! This salad looks a little fancier, but it’s so simple and delicious. In a large bowl, whisk ½ C olive oil with honey, vinegar and 1/2 teaspoon each of salt and pepper. Add shrimp to the bowl and toss. Let this marinate for ½ hour to an hour. 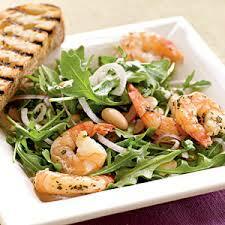 While shrimp is marinating, prepare salad. Lay arugula on a large platter. Top with cheese shred, raisins and almonds. Shake a pinch each of salt and pepper over the greens and drizzle with the remaining olive oil. Grill shrimp and place over the salad greens. Cheers to summer, to cookouts and catching fireflies, to water baloon battles and cannonball jumps into the pool, to berry picking. Let's hope we have loads of sunshine here in Pittsburgh! Until next time, mangia bene! Copyright 2013 Dana Faletti. Simple theme. Powered by Blogger.